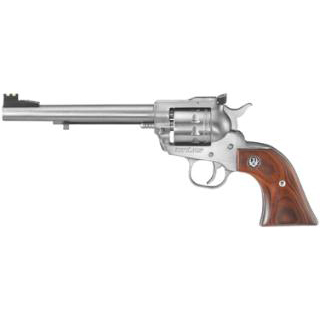 Ruger 8150 Single-Nine Single 22 Winchester Magnum Rimfire (WMR) 6.5 9 rd Hardwood Grip Stainless Steel in. Rugers SingleNine features a patented transfer bar mechanism and loading gate interlock provide an unparalleled measure of security against accidental discharge. It has a cold hammerforged barrel Williams adjustable fiber optic sights and is perfectly sized.This model has a 6.5 stainless steel barrel frame and cylinder. It also has a hardwood gunfighter grip."